"No more hundred bullets. Graves' game is over." 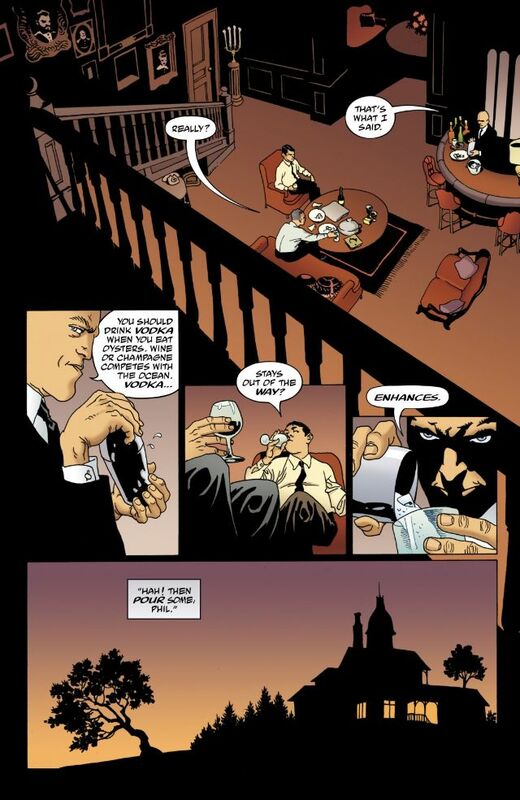 Oh, but it has been a very long game, cleverly played, and it ain't over until Agent Graves says it's over. There are many more bodies to be bagged before then. No one here gives up without a fight, least of all Lono and, let me tell you, it's going to get gruesome. 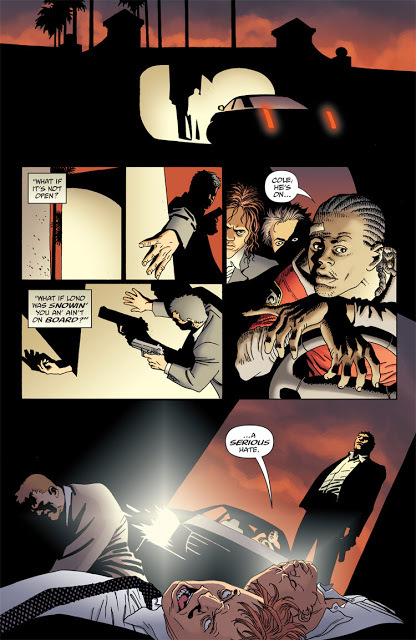 There has been an additional mini-series since these 100 issues, already collected into 100 BULLETS: BROTHER LONO which, if anything, is even more wince-worthy. Each previous book has also been reviewed in greater depth than this. However, how's this to whet your appetite? 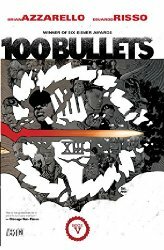 100 BULLETS was riveting crime fiction which sensibly began with a simple proposition before spirally into all-out warfare. The war is being waged between the Houses of The Trust, The Minutemen they used to employ as keepers of the peace, and anyone Agent Graves believes he can use in his very long game of goading, guile and perfect positioning, even from the very beginning. The proposition was this: ancient Agent Graves would turn up at your house and present you with a briefcase. In that briefcase would be irrefutable evidence that someone has done you wrong, who the culprit was, and how if not why. Also enclosed: a gun and 100 rounds of untraceable ammunition. By that I mean that if these rounds were found spent or unspent at the scene of any crime, all investigation into that crime would cease. You have immunity - from the cops at least. What would you do? Every nuance, every cadence of contemporary urban street patter is captured. Each line has a lovely lilt, and every character is ridiculously witty that the series reads like one long Jim 'Foetus' Thirwell song. As the series unfurls sleeper agents are activated, sides are taken, sides are swapped and lives are wrecked at home, in the street, and in prisons, bars and hotels all over the country. Now the final battle is on. The shadows - already dark - grow longer, the colours are very rich in red and, lord, but those bruises are livid. "Some people just deserve to die."